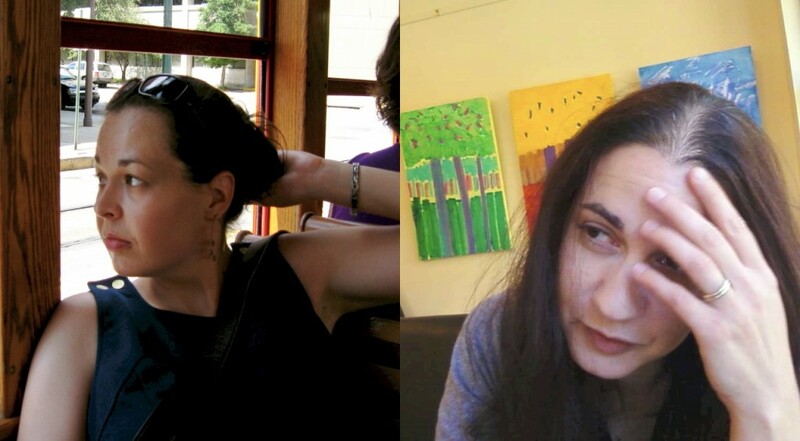 Monica Berlin and Beth Marzoni’s jointly-written piece “Once, the Nomenclature of Boulevard & Thoroughfare Turned Common” appears in Midwestern Gothic Issue 14, out now. Well, hard to say. We’ve always been, even when we weren’t. We’ve been in conversation for more than a decade—a conversation begun in the winter of 2002. The easiest answer to this question, or the oversimplified answer, is that we’ve been consciously making poems together—the poems of which [Once, the nomenclature of boulevard & thoroughfare turned common,] is a part—for just over two years. Before that, we made poems in correspondence for a few years, and before that we both wrote alone. And we have continued to write alone, but even then our writing lives are the center of gravity for all of our conversation. The whole time we’ve known each other, and then maybe even before we knew each other, our lives a gathering of seeing and looking and listening that led us here, to these lines, these rooms, and that may continue, or that may evolve into another. Our work together is dependent on that landscape. The landscape is the vocabulary for that work. It’s where we live, or rather where we sometimes live. One of the ways we both find the poems really interesting is that our connection to the Midwest is not the same—that it doesn’t mean the same thing to both of us at the same time. Beth thinks about the landscape photographer Robert Adams, who once said that his job was to go into the landscape that he feared the most and to keep photographing it until it no longer scared him. Monica has tried to figure out how to stop apologizing for the Midwest, how to stop turning away from it, to learn how to be in it, to know it in whatever way we can ever really know any place. We’ve sought to learn to recognize it, sometimes for the recognition that might mitigate its size and shape, its diverse topography and oceanlessness, sometimes to learn to accept it for what it is—sometimes saturated, sometimes parched, always stretching wide and long (Christ, how long is Illinois!) even as it also narrows. This way: Marianne Boruch writes: “Never the self congratulating East with its historical weight such a burden, or—in reverse—the blow-it-off-don’t-look-back (yahoo!) of the West. But an ache, a doubt—too many doubts—a shadow, a shrug, a feel for hope and desperation in equal amounts. So we apologize without reason, or because we’re prophets, or because we’re bored, or because we really are sorry about everything and haven’t a clue what to say. Or because we’re just curious and that thought might open up a new trap door to yet another cellar of pain or discovery…. But it is a discipline. One has to stare longer, be stranger, as needed.” And, also, like this: Nancy Eimers’s saying, “But somehow this Midwest—or my introverted version of it—makes possible a certain receptivity out of which passage just may come. Passage—transport—is what I tremble for each time I begin to write a poem or find myself in the middle of one. // What the Midwest is to me is a place to be from, a place to live.” Yes, those ways. And others. We aren’t sure that that’s true, and believe us when we say we’ve thought about this a lot, considered it from many different angles and perspectives. And we think the designation, regionalism, in American Literature is usually the work of critics, not writers. The writers we know aren’t interested in being Southern writers or California Writers or god forbid Midwestern writers. They’re just writers. Which is all we ever are first. Subject matter or approach, for any and all of us, may make the case for school or period or style, but no more would we say that New York writers only make New York the matter of their work any more than we would insist that writers from Iowa were only allowed to consider a cornfield. To do so, of course, would diminish the labor of the imaginative realm, every writer’s first and most essential tool. It would also diminish the fact that we are each individuals who live in a place, or who have lived many places. To say that the stuff of our own lives—what we know and are a part of—is the only matter that matters in the reading of our work, or in the making of it, is to restrict that passage of which Eimers refers, to dead-end the passage by suggesting that the only kind possible is out the door onto one’s own front stoop. Hm. Well, we love the Great Lakes twitter feed, and are devoted to Lake Superior, despite his pithy hubris. Honestly, we don’t have much patience for social media, but we also recognize that it’s a thing, a thing that we all do. There’s the issue of time, there not being enough, ever. Every tweet or status update or blog post we read, even from a Great Lake, is time spent not making a poem, or reading a poem, and so we both minimize that distraction, because, well, the world is distraction enough. Maybe it’s selfish or unfair to say so, but we rely on others. We have, thankfully, good friends who give a shout out when they read something of ours, and for that we’re grateful. It’s an impossible question, but in the best way. So, here’s the truth: we love a lot of different books and we need them all, not all on the same day or for the same reason, or ever for the same reason, but they are all with us, always. What’s in our piles these days: everything. At the top of those piles and for a while have been Ralph Angel’s Your Moon, Marianne Boruch’s Cadaver, Speak, and Bogotá by Alan Grostephan. What are the favorite books of this work, these poems? Muriel Rukeyser’s U.S. 1, James Agee’s Let Us Now Praise Famous Men, Patricia Hampl’s Spillville. Most honestly, though, there is nothing that this work hasn’t loved us reading, and it has made use of it all—even the weather reports. Is coffee a food? Clementines. By the five pound bag. Also Thai—in particular, Thai at this place called, we kid you not, Amazing Thailand. It is in Minneapolis. You can thank us later. Also we like pie and pomegranate Popsicles. We are both sometimes shy. We sometimes find it difficult to have coffee (or tea or a beer) with strangers, especially ones we might admire or have crushes on or envy. So, ultimately, we would probably pick a friend, and one who we don’t get to see as often as we would like. We’d probably take Nancy Eimers and Bill Olsen out for sodas. Monica would have coffee. Beth likes to keep things unpredictable. We both have websites—monicaberlin.com & bethmarzoni.com. If you would like to read more of our work, poems are available on-line at Better: Culture & Lit, DIAGRAM, Meridian, New Orleans Review, Quarterly West, and TYPO. Our book, No Shape Bends the River So Long, is coming out from Free Verse Editions at Parlor Press later this year—just in time for your holiday shopping!